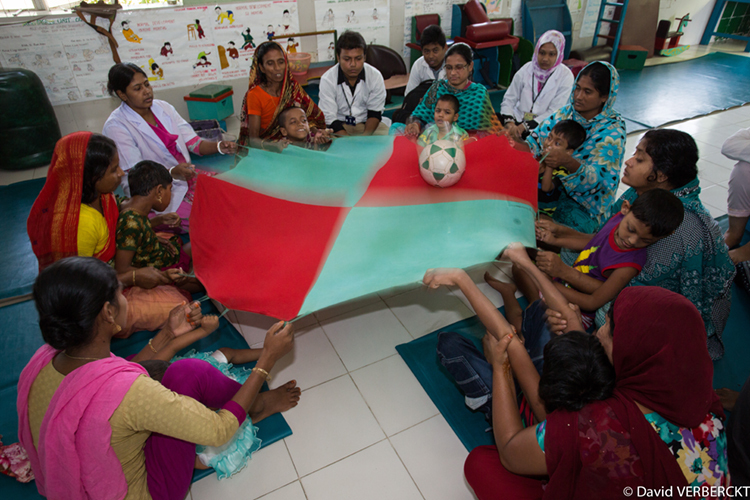 Children are referred to CRP after an initial assessment by a multidisciplinary team (which includes physiotherapists, occupational therapists, speech and language therapists & pediatrician) through other institutions or CRP's Community Based Rehabilitation programme. Depending on a child's condition, an appointment is then made at outpatient services for an individual treatment session or in order to join the two-week residential programme. The main function of the Paediatric Department is to run a two-week residential programme designed to integrate children with cerebral palsy and other diseases into family and community life. To achieve this, children participate in physical and psychological therapy and caregivers/mothers are trained how to care of their child, health, education and make them aware of disability issues and rights as well as mainstreaming development. As per child condition, we provide assistive devices and low tech AAC materials. The Paediatric Department treats different kinds of paediatric conditions such as: cerebral palsy, GBS, Down’s syndrome, Erb's palsy, clubfoot, flat foot, congenital deformity, Autism Spectrum Disorder, learning disability, behavioral problems, muscular dystrophy, spina bifida, myopathy, intellectual impairment, peripheral neuropathy and others. In every Wednesday, Autism Group therapy provides in outdoor service.